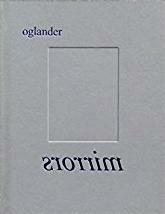 From the publisher: Mirrors was derived from Eric Oglander's online project, Craigslist Mirrors. Described as a document of Oglander's continued search via craigslist for compelling photos of mirrors, his site is a display case for these culled objects; artifacts recovered from a well of online obscurity. Refocusing the essence of the project's emergent themes (anonymity, fragmented realities, voyeurism, notions of truth, and crowd sourcing) the book distills Oglander's project down from a diffuse cloud of images-of-objects-that-cast-images, back again to object itself. The images collected here pull the viewers gaze through the page to the cross-section of two narrow planes of someone's reality. They are glances that teem with a sense of further exploration if we could just direct our view behind us. Mirrors embodies Oglander's desire to explore minimal forms amongst a vast community's subconscious endeavor to transmit the formless. USA, 2016, 18 x 23cm, illustrated, 96pp, Hardback.